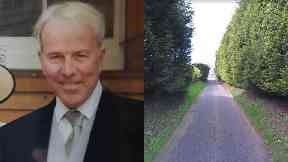 Allan Burns, who has dementia, was last seen around three weeks ago in Renfrewshire. The family of a missing man has appealed for information three weeks after he was last seen. Allan Burns, from Kilbarchan in Renfrewshire, was last seen at around 3.15pm on Friday on a cycle path walking towards Lochwinnoch. The 71-year-old, who has dementia, has not been seen since and his family are growing increasingly concerned for his safety. They said on Monday: "Our dad, Allan Burns, went missing on January 18 this year and was last seen just past Castle Semple in Lochwinnoch around 5pm. "As a family we are struggling to cope and are extremely concerned for his safety and well-being. Appeal: Mr Burns' family say they are struggling to cope. Inspector Laura Hamill, of Renfrew Police Office, who is leading the search, said police continued to make inquiries in a bid to trace Mr Burns. 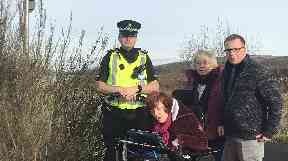 She added: "There have been no confirmed sightings of Allan since around 5.15pm that day in the Lochwinnoch area. "We are continuing to ask those residents who live in or around the Lochwinnoch area to check their gardens, sheds and any outbuildings to make sure Allan has not taken shelter within. "Although our searches are focused in the areas where Allan was last seen we would ask people living in the surrounding area contact us if they have any information to assist in our enquiries." When last seen, Mr Burns was last seen wearing a grey tammy hat, a khaki green waterproof jacket with tartan lining, dark blue jeans, grey walking boots and a maroon and grey striped scarf. Anyone with information about his current whereabouts is urged to contact Police Scotland on 101.